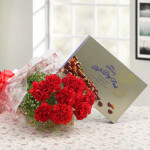 Beautiful carnation blossoms with a pack of Cadbury Celebrations are a wonderful gift to celebrate any occasion. Nothing will express your love better than this wonderful gift hamper. It is sure to make your near and dear one's day more special.